The best kind of generosity is done with others, not for others. People of means and substance are growing weary of fundraising run by charity leaders who have adopted the tactics of professional salespeople. They're looking for ways to make change that's important to them, rather than just responding to an endless stream of appeals and campaigns. 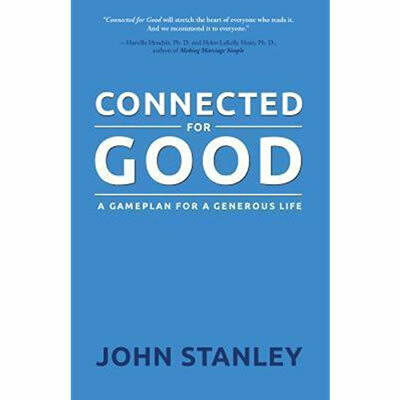 In Connected for Good, John Stanley explores the Generosity Gaps places where men and women hold back their giving because it's not the right time, I don't have enough, or I might be making a difference, but I'm not seeing lasting change. He then presents a fresh playbook for generosity based on the heart's desire for connection. Going beyond the traditional time, talent, and treasure, he encourages giving from the renewable currencies of relationships, strengths, and resources. And he explores how to make use of the multiplier effect to greatly increase impact. The step-by-step Generosity Gameplan® process leads you to craft your own strategic giving plan so that you can feel good about saying no and make your yes that much more effective. Looking beyond the checkbook and focusing on people and causes you care deeply about creates transformational giving experiences. Building relationship bridges between people for their benefit, not yours, is an act of generosity that multiplies. With a clear gameplan for living generously, more and more of us will be connected for good. John Stanley is an advisor to major donors and strategic grant-makers. He founded The Legacy Group in 1999 to serve generous people and the foundations and nonprofits they care deeply about. John spent many years with the YMCA and served as Chief Executive Officer of Camp Manito-wish in the Northwoods. He and his wife, Jamee, live in Wisconsin and have two adult children.